Opie’s Gifts will be there with some new aprons and introducing kid’s reversible aprons. Phillips Organic will be there with heirloom tomatoes, chard and a new crop of yellow beans, garlic, spaghetti squash, dill, and patti pan squash. Mackenzie’s, J&W, Dave the Honey Guy, Nice Farms, Mellander Maple and Peg’s Produce will all be there as well. Our entertainment for the day will be the LeRoy Town Band! See you all tomorrow at the market! We would like to welcome our newest vendor Mc-B’s Farm from Gasport! Krys and her husband will be bringing their own fresh raised meats such as duck, lamb, chicken, rabbit and more. Please give them a warm welcome when you see them tomorrow! Glen Haven Farm will have tomatoes, garlic, cucumbers, zucchini, squash and sweet corn. Phillips Organic Farm will have mixed salad greens, Swiss chard, dill, patty pan squash, zucchini, garlic and blueberry vinegar. Opie’s Gifts will be there with aprons, new ties, new wristlets and pumpkin decorations. Peg’s Produce will have farm market bouquets, gladiola (special 6 for $5.00), TOMATOES, fresh garlic, Spanish and Red Defender onions, green and yellow zucchini, cucumbers, kale, and beets. J&W will be adding potatoes and onions to their usual veggie offerings. Mackenzie, Dave’s Natural Honey and Nice Farms will all be there. Ma Fille Bakery and Mellander Maple will not be at the market tomorrow. Our Entertainment for the day will be Alannah Gross on Vocals and Guitar. Our community booth will be full with St. Mark’s Episcopal Church! Ma Fille Bakery plans on bringing donuts, pound cake, blackberry pies, raspberry pies, peach pies, oatmeal maple scones, honey wheat bread, and cinnamon rolls. Peg’s Produce will have farm market bouquets, squash, cucumbers, onions, fresh garlic. 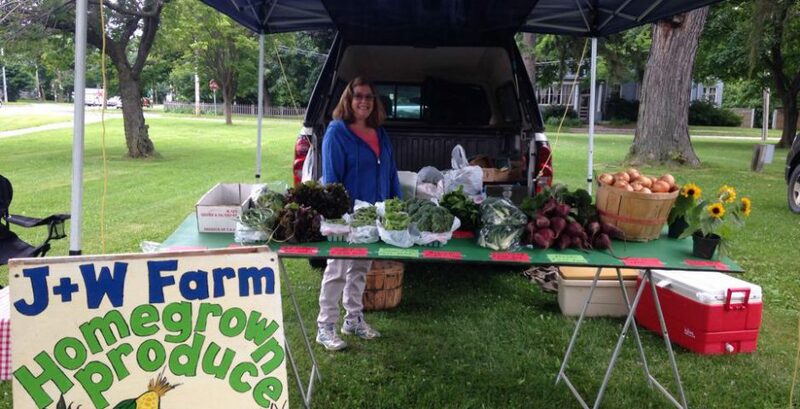 J&W Farms will be there with melons, sweet corn and their other fabulous veggies. Opie’s Gifts will be there with some new ties and reversible aprons and tons more! Phillips Organic will have organic Swiss chard, mixed salad greens, dill, zucchini, Pattie pan squash, garlic and Pat Lapoint vinegars. Nice Farms, Mackenzie Farms, Mellander Maple, and Dave’s Natural Honey will also be there with their locally grown products! We would like to welcome Kylie Smith of Glen Haven Farm to our vendors this week. Let’s give her a warm welcome! Sue Hengelsberg will be our entertainment for the day with her Dulcimer and vocal talent and First Baptist will be handing out info about their free school supply distribution. Have a wonderful weekend and see you at the market!